One of the most versatile ingredients I can think of is dairy. It has a pretty neutral flavor and is rather Full of Fat. I appreciate that in an ingredient. Here’s the thing about fat–it absorbs flavors readily. This is why they tell you to wrap your butter really well and not to store it next to the onions. Liquid dairy has butterfat floating around in it. Skim milk hardly has any, and I don’t like it for baking anyway, but whole milk contains at least 3.5% butterfat and heavy cream can have upwards of 40%. Regardless, the point is that butterfat absorbs flavor. Here’s another cool thing about dairy. It’s basically a suspension of fat in water, so not only will water soluble stuff dissolve in it, but fat soluble stuff will, too. We can harness this to our advantage. Hooray! Steep anything in dairy for awhile, and the dairy will start to taste like the steepee. That’s not a real word, I suppose, but you know what I mean. Anyway, there are a couple of ways to get flavor into dairy. You can heat up the dairy and then steep something in it for an hour or so, or you can leave the dairy cold and steep something in it overnight. If you are a poor planner, like me, or if you just run out of time, the Hot Steep works pretty well. Since hot liquid can tend to bring out bitterness in some steepees, you will get a mellower flavor if you do a cold steep. Either will work, though. So, what’s the procedure, Jen? Miscellaneous–coffee beans, tea, strips of citrus zest, etc. Sneaky trick: if you want coffee flavor without the coffee color, steep whole beans in the dairy. If you want the coffee flavor and color, crack or coarsely grind the beans before steeping. Okay, so give me an example. Place hazelnuts and dairy in a blender. Blend until nuts are coarsely chopped up and the dairy is all frothy. Refrigerate dairy overnight. Strain through a fine strainer, pushing down on solids. You should end up with 4 cups of dairy. Whisk eggs and yolks together with salt and half the sugar. Heat the 4 cups of dairy with the rest of the sugar until just below a boil. Temper all the dairy into the egg mixture, and then strain into a large pitcher. Do not continue to cook. Whisk in the vanilla and liqueur. Taste for salt, and add more, if necessary. Cook some sugar to a medium amber color, then pour about 1 1/2 TBSP into individual ramekins or pour in enough to just coat the bottom of a larger container (maybe a 9" cake pan). Place ramekins or pan into a larger pan lined with a kitchen towel. Fill ramekins to within 1/4" of the top (fill cake pan w/all the mixture) and put in the larger pan. Place the pan on the oven rack and carefully pour hot water into the pan to come halfway up the sides of the ramekins. Cover the pan with a baking sheet or with a large piece of heavy duty foil. Don't let the foil touch the custard. Bake at 275 degrees until just set. This could take awhile--maybe up to an hour for individual ones and even longer for a big old flan. A knife inserted into the center should come out clean, but the custard should still have just a bit of wiggle in the center. Carefully remove from oven and cool at room temperature for an hour or so. Refrigerate until cold. To serve, run a thin knife around the outside of the ramekins/pan, firmly hold a plate on top and flip the whole thing over. Lovely caramel should pool around the flan. Serve with a wee quenelle of whipped creme fraiche and some sort of a crunchy thing--hazelnut streusel would be nice. Or maybe biscotti w/hazelnuts. If you don't need 12 4 oz servings, you could make 8 6 oz servings or you could just half the recipe to make 6 4 oz servings. You can also bake as one large flan and serve it sliced. Baking time will increase significantly. So, there you have it. 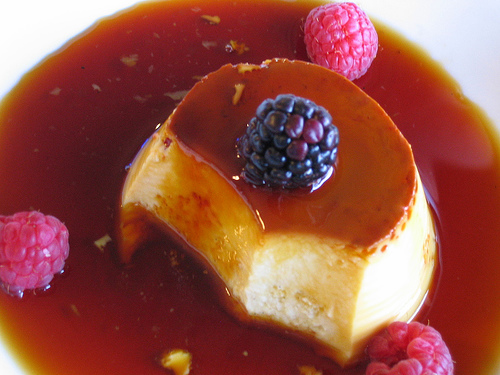 This flan is seriously good and seriously hazelnutty. I love it a Very Lot. PS If you bake this flan too quickly, it will curdle–don’t rush it. Oh yum! I luvluvluv hazelnuts and flan separately and now together! 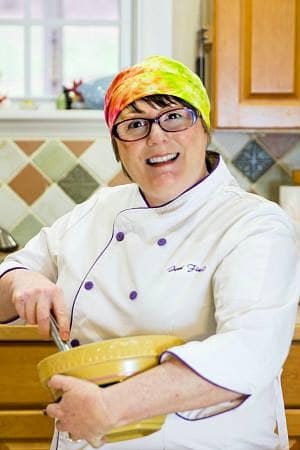 My MIL gave me a head’s up that she’s making creme brulee for Easter dessert so this will have to wait a little bit – then, it’s flan-time! Hmm, could one do a goats milk flan with radish and tarragon coulis! I really have no idea what I’m talking about. I’m all visual so things sometimes look cool in the recesses of my mind, but I wonder how this might taste. I want to turn dessert on its ear this spring. This looks yum! I’m gonna have to try it. Although I don’t eat eggs and have done all my baking (brads, cakes, etc) with ener-g egg replacer. Do you think that’ll work here too? Thanks for your comment on our blog. 🙂 Hummus rocks! Hi there, Meenakshi! I do not have any experience with ener-g egg replacer, so I really don’t know. If you can scramble it like eggs (ie: it makes curds when you heat it), you should be able to sub it. Anyone know for sure? Well-written. Clear and easy-to-follow. Good job once again, Jen! Thank you. I am doing a pastry baking internship at a French bakery in Istanbul. The baker is Turkish, but she grew up in France. I will tell her about your site because you have some great information that could be helpful. I’m so glad you’re finding my posts helpful, Franklin! Very exciting about your internship–hope it goes great. That’d be very cool if you share my site with the baker. Thanks! 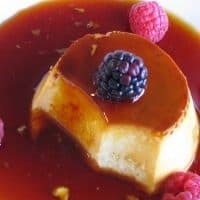 Is there a printer friendly version of this hazelnut flan? It does now! This is one of my older posts and I updated it with Easy Recipe for you. Sorry for the inconvenience! This is brilliant. A great way to bring in the flavor of hazelnuts without sacrificing the creaminess of flan! Sharing on Desserts Required’s FB page this week.